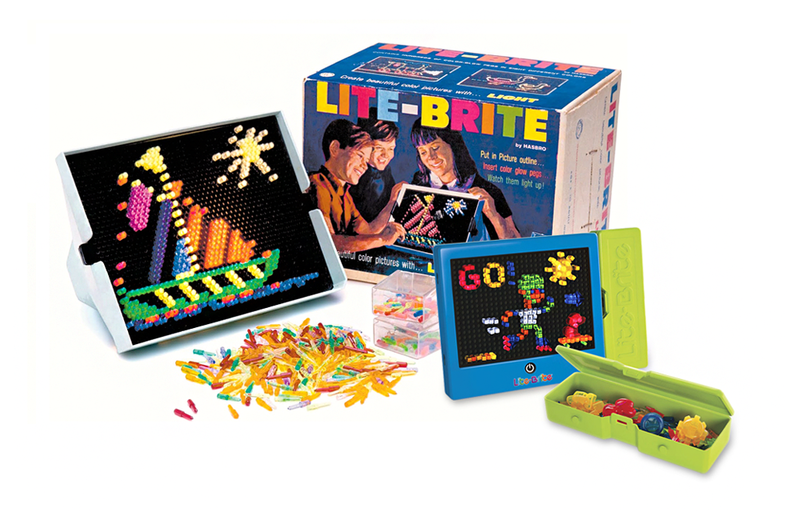 Then & Now: Lite-Brite – Makin’ things with Light! THEN: Hasbro released Lite-Brite in 1967, ushering in a new era of “making things with light” for millions of budding young artists everywhere. The toy’s lightbox design was elegantly simple: a white plastic case with a black plastic grid of holes, backlit by a 25-watt incandescent light bulb and covered by black sheets of paper. The overall look was similar to a small television with a perforated screen. Using the blank canvas, kids could poke one of the 400 coloured pegs (clear, red, green blue, yellow, orange, pink, and purple were provided) through the paper into the grid, causing them to light up in the pattern of choice. If free-form design didn’t suit a kid’s fancy, Hasbro offered dozens of pre-patterned “color by letter” picture sheets that were sold as refill kits. Pop culture tie-ins included patterns depicting characters from Star Wars, My Little Pony, Scooby-Doo, and Jurassic Park, all available for Lite-Brite screens over the years. NOW: Today’s Lite-Brite Magic Screen has undergone a high-tech makeover. The light box has been upgraded to use LEDs that are powered by batteries, and a shrink-ray has been applied to the toy, reducing overall screen size to roughly 50% of the original and making it more portable than before. Lite-Brite now includes 200 pegs, a removable storage tray, and six reusable pre-stamped templates. The toy also features new enhancements, including four light effects and a button that, when pressed, causes finished designs to glow. Lite-Brite refill packs are still available. In addition to marketing some interesting variants, including the Lite-Brite Flat Screen and the Lite-Brite Cube Playset, Hasbro also recently tried its hand with a short-lived Lite-Brite app for the iPhone. Released in 1969, the toy with the tongue-twister name combined fun with scientific principles and drew its design inspiration from Leonardo da Vinci's 15th-century drawings of imaginary flying machines.